The Colonie recently teamed with Burrell Communications to provide editorial, VFX and design services for ‘I Do,’ a broadcast spot introducing the 2017 Toyota Corolla. Creative editor, Bob Ackerman took the automaker’s tagline, ‘Let’s Go Places,’ and ran with it. 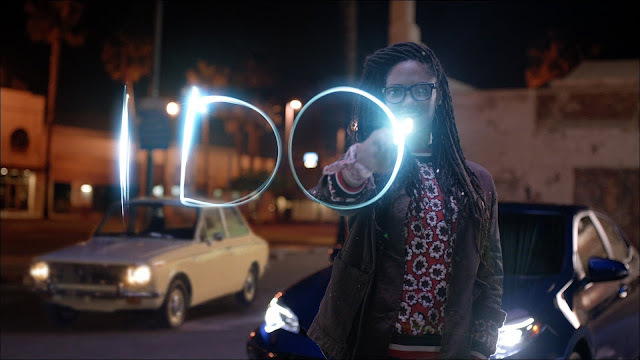 Fast-paced cuts and editing effects helped create an upbeat message that celebrates the bold creativity of both the new Corolla, as well as its target audience - today's ‘on-the-go’ generation of young African Americans adults. From the get go art director, Winston Cheung, was very focused on keeping the tone of the spot fresh and young – and his attention to detail was key. When selecting footage during the edit session Ackerman and Cheung made sure to utilize some of the more playful set-ups from the yarn vignette to providing the bold color palette for final transfer. The second scenario finds an enterprising man parking his Toyota Corolla and unloading his 'Pop-Up Barbershop' in front of a tall wall adorned with artful graffiti. A well-placed painting of a young man’s face under a huge Afro-shaped dome of leave that extends over the top of the wall completes the picture. No sooner does the barber sets up his chair and sign then his first customer arrives. The Chicago-based editorial and visual effects boutique’s team explored several methods for creating the various VFX in the spot before deciding upon a combination of Flame Premium and After-Effects. Then, it was a matter of picking the right moments. Ackerman grabbed some of their top choices, roughed in the effect on the Avid Media Composer, and presented the client with a nearly finished look right from the very first rough cuts. 'I Do' called for an aggressive and playful editing style that still had to accomplish some heavy lifting to showcase some of the Corolla’s features, such as its back-up camera and automatic lane departure system. “We very appreciative of the trusting and collaborative relationship our team has developed with the Burrell over the years,” says The Colonie’s executive producer, Mary Caddy. “The creatives at the agency consistently come up with forward-thinking creative solutions tailored to a product’s target market - and we’re always thrilled to have an opportunity to work with them."